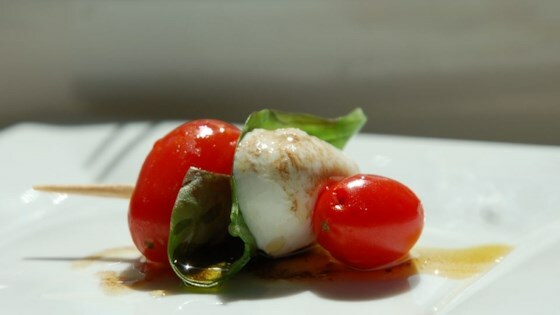 "A great way to serve tomato mozzarella salad. Great presentation; always a hit! You can find the bite-sized mozzarella ('Bocconcini') at most supermarkets. If they are on the larger side, cut them in half." Using a toothpick, spear a half of a tomato, a leaf of basil, a mozzarella ball, and another half of a tomato. Repeat with remaining ingredients. Place on a serving dish and sprinkle with salt and pepper. Mix the vinegar and oil together in a small bowl to serve as a dipping sauce. If you only use 1/2 grape tomato, basil leaf, & 1/2 mozzarella ball on a toothpick, you have a 1 bite snack! Yummy!